I am not a beer drinker and, if I am honest, I really don’t get the attraction of that bitter, slightly soapy flavour it has. My beer drinking exploits only really kick in when I am sitting outside a café in the sunshine in a hot country, when one sip of lager makes me feel totally abroad and on holiday. However, I am often asked about gluten free beer options in Edinburgh, so I have done some research for you. Inevitably this has meant drafting in some boys to drink the beer for me, but I have not heard too many complaints! There are a few beer specialists in the city who have gluten free beer for sale. The best selection I found was at Beerhive on Rodney Street in the New Town. The shop has a full gluten free beer shelf, with a good selection, though they are largely from abroad. 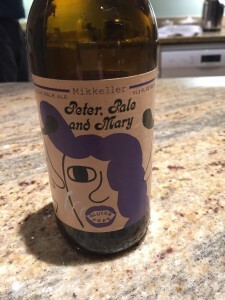 I enjoyed the label of “Peter Pale and Mary” both for its name and design. Furthermore, this beer got the thumbs up from the boys, being light and frothy. Also on offer were GFPA from England and Stone from San Diego. There was also a Spanish beer and a Danish one called Mikkeler, which is widely said to be the best of the bunch. So give Beerhive a go if you are after a selection – they are knowledgeable and friendly and for those of us who don’t drink beer, they also have a good gin selection! You can also buy beer from BrewDog: at one of their bars. They had a shop on Dundas Street but it has closed, so I do not know of an alternative at the moment – sorry. However, I do know that Vagabond is both a good beer and gluten free. Hot off the press is news that Tennents Lager has launched a new gluten free lager called Gluten Free T. Available from Tescos and pubs, clubs and bars across Scotland, this has already been well received in Italy. To find out more you can follow @tennentslager on Twitter and you can enjoy the new campaign around the launch, with the chance to nominate what’s missing from your night out. I have not yet tried this lager, but will be looking out for it and will give an update. In my research I have been talking to the team behind the forthcoming Bellfield Brewery – Edinburgh’s first fully gluten free brewery – coming soon. They have told me that the beers I have been trying are all brewed using barley, but that during the brewing process an enzyme is added which removes the gluten from the beer, though a tiny percentage still remains. What Bellfield does is to create beers that are made using naturally gluten free products, so no enzyme is be required. These beers are beginning to pop up around town, so look at the website for stockists. Bellfield also told me that only a handful of breweries in the world are producing in this way, which makes them brave pioneers! It is terrific to have a truly homegrown Edinburgh gluten free beer! So which pubs will serve you gluten free beer? The obvious candidate has to be BrewDog craft beer bar at 143 Cowgate, where you can drink the great Vagabond beer while your mates enjoy the wide selection of other stylishly packed beers from BrewDog. The Doric, behind Waverley Station on Market Street is an Edinburgh institution and has a good classic pub vibe to it. The Doric serves Celia Premium Lager and Estrella Daura Lager. The food is also good and there are plenty of gluten free options, so this is a good choice if you want beer and food – like ‘normal’ people. A trip to Portobello is always a pleasure, as you will know from some previous posts. The Skylark at 241-243 High Street, Portobello is worth a try. Part pub, part French bistro, this is a good example of the hippy, slightly bohemian style you find in this area – far trendier than me. The Skylark tells me they have three gluten free beers on offer: Daura Damm Lager; Mongozo Premium Pilsner; and the ever-present Vagabond. I shall definitely be heading down there on a rare hot day to sip lager in the sunshine! As we have reported before, the ever-fantastic Mamma’s Pizza on the Grassmarket will also bring you a gluten free Pilsner with your pizza.